Joshua Oppenheimer's films on the massacre of Indonesian communists poignantly capture the slaughter's lasting scars. This was the year that the Indonesian government — led by Sukarno, Indonesia’s first president and an anti-imperialist known for his revolutionary opposition to Dutch colonialism — was deposed by Suharto, a right-wing general. Suharto launched a violent campaign that swept across Central Java, East Java, Bali, and North Sumatra, in which over a million and a half people, all accused of opposing the new military dictatorship, were rounded up and massacred. In their mass purge of alleged communists, Suharto and his fellow generals cast a wide net, targeting not only left-wing intellectuals and union organizers but landless farmers and ethnic Chinese. And once Suharto consolidated power, the massacres weren’t just swept under the rug. They were redefined as legitimate, even heroic. In 2001, Joshua Oppenheimer, a young American filmmaker, traveled to Indonesia to make a documentary about a community of plantation workers struggling to unionize after the Suharto dictatorship. Oppenheimer was eager to experiment with new documentary methods, but ran into one obstacle after the next. The workers, whose parents, aunts, uncles, and grandparents were killed decades earlier, were afraid that something similar could happen to them. They urged Oppenheimer to interview the perpetrators instead, believing that as a foreigner he might be able to find out how their relatives were killed. Those responsible for the massacre are still not behind bars and in fact, remain very much a part of Indonesian society. Many are members of the Pemuda Pancasila, a right-wing paramilitary organization that boasts openly about carrying out extortion, mass murder, and war crimes. Oppenheimer’s first feature film, The Act of Killing, centers on Anwar Congo, the former leader of a death squad in Medan, an Indonesian city of about 4 million people. Congo flamboyantly saunters across the screen, hidden behind dark sunglasses and sporting vintage suits in lime green and yellow. He talks about his love for movie stars like Marlon Brando, Al Pacino, and John Wayne. And he tells his own tales about how victims would plead for their lives before he strangled them to death with a wire tied to a stick, a technique he learned from a gangster film. “Can I show you?” he asks Oppenheimer. Oppenheimer’s latest film, The Look of Silence, begins with similar footage. Two former death squad leaders take Oppenheimer to the banks of North Sumatra’s Snake River while jubilantly reminiscing about how they helped the army eliminate 10,500 people, decapitating them before throwing their corpses into the water. As the two men smile for the camera, Oppenheimer zooms out, and we realize that we are not alone in bearing witness to this recollection of mass murder. We are joined by Adi, a young man whose brother Ramli was brutally dismembered at this very location. While The Act of Killing is dominated by cinematic vulgarity and haunted by absent victims, The Look of Silence focuses on what it means to be a survivor in such a reality, forced to move on with daily life under the watchful eyes of those who murdered your loved ones. Adi, the film’s central character, is an optometrist whom Oppenheimer enlists to conduct eye exams on the perpetrators of his older brother’s murder. While fitting them for glasses, Adi calmly insists that they accept responsibility for their actions. He is met with frustration or denial, the killers unable or unwilling to see their crimes. In The Look of Silence and The Act of Killing, we see Oppenheimer’s affinity for French filmmaker Jean Rouch’s style of cinema verité. Rejecting the notion of a filmmaker as “a fly on the wall,” Rouch understood filmmaking to be less about depicting reality than about creating its own truth. And he encouraged his subjects to take part creatively in the making of his films and openly discussed his own role as the instigator of the events that unfolded — a radical departure from traditional documentaries. In this way, Oppenheimer’s film also resembles Claude Lanzmann’s Shoah, which Lanzmann called “a fiction of the real.” Many scenes in Shoah are staged, including the famous sequence in which Abraham Bomba, the retired barber who had cut hair at Treblinka, pretends to cut a friend’s hair while telling his story in a barbershop in Israel. Like Lanzmann, Oppenheimer spurns archival footage, structuring his films around interviews with witnesses to the atrocities. He is drawn to how history reverberates in the present, as trauma. The lush Indonesian landscape is as haunted a space as the train tracks in Shoah. Yet, unlike Shoah, Oppenheimer explores a still-unacknowledged massacre. In Indonesia, denial is sustained both by the perpetrators in power and by the survivors, for whom the threat of renewed violence is very real (as evidenced by the long list of anonymously cited Indonesian crew members in the credits). And yet the wound is still gaping for Adi’s family. We meet Adi’s elderly mother, Rohani, as she is hanging laundry and singing about her son Ramli. Her words bear witness to the horrors of the past and her refusal to break ties with her son’s memory. She tells Adi that he is Ramli’s replacement, that without him she would be unable to continue living after the tragedy that shook her family and the entire village. In his press notes, Oppenheimer explains that he found Adi’s family because “Ramli” became a name almost synonymous with the killings. Unlike the thousands of victims who disappeared at night, Ramli was murdered in public. Survivors talk about Ramli because there were witnesses to his final moments, when the killers left his body in the oil palm plantation less than two miles from his parents’ home. Oppenheimer writes, “To speak of ‘Ramli’ and his murder was to pinch oneself to make sure one is awake, a reminder of the truth, a commemoration of the past, a warning for the future.” Adi, born after the killings, was not afraid to reach out in order to “pinch” others, demanding answers and an acknowledgement of his brother’s murder. Oppenheimer’s filmmaking is an occasion for Adi to provoke conversations that wouldn’t otherwise occur. In The Act of Killing, the perpetrators revel in their own performance, prompted by the presence of Oppenheimer’s camera. In The Look of Silence, however, Adi becomes the provocateur. Tensions and truths are revealed not through performance or theatrics but through simple conversation. The film depicts one meeting after the next, Adi sitting with his brother’s murderers. He asks them about what they did, how they feel about it, and even how they can reconcile their actions with Islam. One of the most shocking displays of denial involves the crimes of Amir Hasan, one of the leading Komando Aski generals, who previously boasted (on film) about his role in the bloodshed and even published a book about his deeds. In a scene near the end of the film, Hasan’s widow and sons deny any knowledge of their father’s participation in the killings, even after Adi confronts them with the old footage. While Oppenheimer initially considered the scene a “complete failure” because of the family’s delusions, he ended up deciding the denial “honestly shows the state of Indonesia today.” It is this same rejection of reality that caused the cancellation of twenty-five screenings of The Look of Silence. Within days of the film’s December 2014 release, the police and army began organizing groups of thugs, who threatened to attack showings. Although denial is rampant, both in the film and its reception, Adi does manage to puncture the silence. The emotional climax of the film centers on a confrontation between Adi and a perpetrator whose daughter sits beside him. As the aging man explains how he drank the blood of his victims, an act of superstition considered by many of the killers to stave off insanity, his daughter is visibly shaken. In this moment of acute vulnerability, it is she who offers an apology, claims that she was unaware of the severity of her father’s actions, and pleads with Adi for his forgiveness. The Look of Silence probes the silences that exist within families and between generations. Later in the film Adi visits his uncle, a former prison guard who conspired in Ramli’s death. The elderly uncle tries to defend himself by claiming he was just following orders. Adi’s mother was unaware of her brother’s complicity. It is only through Oppenheimer’s film and Adi’s investigation that familial silence begins to unravel. “Democracy!” the classroom responds in unison. Later, Adi sits with his children, trying to explain to them the truth — that “communists” weren’t sent to jail, but were hunted down and executed. The gap between his children’s education and Adi’s daily reality of repressed injustice again invites the question: would this conversation have taken place if Oppenheimer hadn’t made this film? Today, the plantation workers whose union struggle Oppenheimer originally intended to document are denied justice for past crimes and are besieged by an economic system that holds them in perpetual poverty. Cold War policies of privatization, free trade, deregulation, and austerity persist. As the wealth gap increases across Indonesia, the government sells the country’s natural resources to multinational corporations and pushes other measures that result in environmental degradation and deforestation. The Look Of Silence is a testament to cultural, economic, and political violence, and has the potential to spark a new dialogue in a climate in which the establishment of a truth and reconciliation committee has been consistently halted. After the Suharto dictatorship ended in 1998, Indonesia established a Human Rights Court to try those accused of crimes against humanity and genocide. Yet all thirty-four perpetrators brought before the court to date have been acquitted or had their convictions overturned on appeal. Near the end of the film, Adi’s blind father, who is over one hundred years old, crawls on the concrete flood, pushing himself forward with his fists, his head brushing against hanging laundry. He calls out to no one in particular: “I’m in a stranger’s house. Help! I’m lost!” Adi’s mother guides him back to safety and later sits with him to recount the story of Ramli, whom his father cannot remember. This moment brings to the forefront the immense sorrow of faded memories within a family, a society, and a world in which the pain of Adi’s family goes forgotten, unrecognized, and silenced. If The Act of Killing exposes the fictions that support the walls of the stranger’s house, The Look of Silence guides us through its interior, finding memories and pieces of truth in its corners, behind its walls. 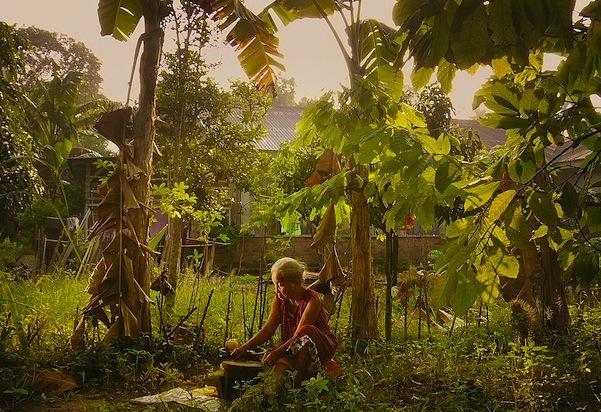 Joshua Oppenheimer’s films on the massacre of Indonesian communists poignantly capture the slaughter’s lasting scars.